"Bigfoot Proponent Comes to the End of the Trail"
Leon Paul Freeman, a central figure in the hubbub that passes for Bigfoot research, died on April 2, 2003, at age fifty-nine. His position within the inner circle of Bigfoot enthusiasts was the result not only of his prolonged activity but his alleged sightings and subsequent footprint discovery in June 1982 of a huge, ape-like bipedal monster in the Blue Mountains spanning the Oregon/Washington border. This incident produced a series of remarkable footprints, sometimes referred to as the Mill Creek prints (after the location where they were found). For a time, these casts with the possible exception of the famous 1967 Patterson film--constituted the best evidence for the existence of the Bigfoot (Sasquatch) creature. The Mill Creek watershed is part of a public water supply administered by the U.S. Forest Service; immediately following the footprint disclosure the Forest Service conducted a detailed investigation. The examination by a wildlife biologist and a border patrol tracker concluded the tracks were a hoax, but in true bureaucratic form the Service withheld the findings from the public. Although a-select few within the Bigfoot community knew of the details of the investigation, Washington State University (WSU) Professor Grover Krantz among them, word was suppressed and those who believed the tracks genuine were never told of the evidence against their authenticity. Krantz, the most vociferous proponent, gained significant support for the reality of the monster within the academic community by presenting plaster casts showing the remarkable detail of the Mill Creek prints. At one point anthropologist Robert Meier, supporting the WSU professor, said that Krantz "had offered cautious interpretations of the evidence." By September 1987, Newsweek was reporting that the Mill Creek footprints "are giving credence to the existence of Sasquatch," proof that Freeman's tale (backed by Krantz's vigorous promotion of the tracks) was winning the battle for recognition. As it turned out, the Newsweek article was the high point of the case; on October 29, ABC's Good Morning America ran an investigative segment on Bigfoot. The broadcast was remarkably skeptical for television-and Freeman himself revealed that prior to the discovery of the Mill Creek tracks he had faked Bigfoot tracks! The Skeptical Inquirer followed up with an in-depth analysis of Freeman's Mill Creek tracks, uncovering not only the Forest Service report, but additional damaging evidence. The investigation was published as the feature story for the Spring 1989 issue. As damaging as the ABC feature and the SI article were, many still had confidence in Freeman's story. In 1989 1 interviewed Vance Orchard, a local newspaper reporter, for an article about people who were on the hunt for Sasquatch. He told me that if "you had to pick someone to go into the wilderness with, you couldn't find a better tracker than Freeman." Unfortunately Freeman underestimated long-time Bigfoot researcher René Dahinden. When both were in the Blue Mountains, Freeman told Dahinden he'd found yet another set of Sasquatch tracks. Suspicious of "evidence" so readily at hand, Dahinden made plaster casts and photographs of the footprints, and upon examination discovered they consisted of an uninterrupted sequence of left, right, left and left, a most unlikely gait for a bipedal creature. During the 1970s a number of people had collected samples of what they thought might be hair from the Sasquatch creature. Various hair "experts" came out with opinions about the samples but ultimately these specimens proved to be inconclusive. 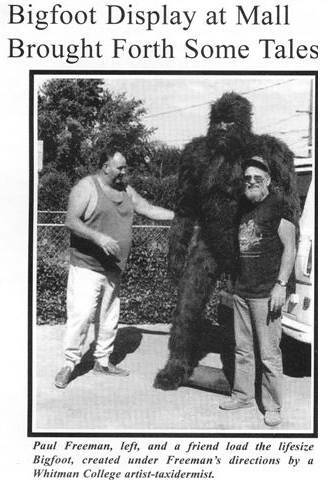 Sometime after his Mill Creek encounter," Freeman began to come across Bigfoot hair samples; one of the first was presented to the ABC crew for the October 1987 broadcast. An analysis by the New York Police Department crime lab concluded that the sample could not be distinguished form human hair. Freeman then produced at least two more sets of "hair," which he gave to Professor Grover Krantz. From information within the Sasquatch research community, I learned that a Japanese laboratory had told the professor the samples were not organic material they were fakes. When I asked Krantz about the results he said that another lab, this one in the United States, had certified the same hair as coming from an unknown creature, but when asked for the names of either lab he declined to identify them. Then came the International Society of Cryptozoology (ISC) conference at Washington State University in the summer of 1989. Evidence against Freeman's "Sasquatch hair" came from a most unexpected quarter: one of Krantz's own graduate students, Lonnie Sumer. Sumer presented a paper on the last day of the conference examining alleged Bigfoot hair samples (he admitted to me privately they were from Freeman) and concluded the samples were synthetic fibers. A subsequent article in tile ISC journal of an analysis from a Swiss laboratory on hair from Krantz's collection confirmed Sumer's findings. The ISC meeting, coming shortly after the Skeptical Inquirer article and in front of those most committed to a belief in Bigfoot, caused permanent damage to Freeman's credibility. Not since the days of Ivan Marx (a notorious Bigfoot hoaxer) had someone so consistently been associated with bogus evidence as Paul Freeman. And, like Titmus & Marx, Freeman is one of a select group to find and cast a set of Bigfoot hand prints (they are gigantic and show the creature without a thumb). Eventually Freeman would go on to find additional Bigfoot footprints, encounter the creature on a second, third, and fourth occasion, photographing and filming it twice. According to the late Bob Titmus, (another hoaxer of evidence) he once told Freeman that to mark a territory an individual Sasquatch would sometimes break off the tops of young fir trees, Freeman then began discovering damaged vegetation, in one case locating a tree with damage well above the reach and strength of any human. Freeman claimed to find a series of Indian cave paintings depicting Bigfoot, scratch marks, feces, and a section of an elk hide with huge teeth marks embedded in it." He even managed to tape record the screech of the monster. But by the mid-1990s only Krantz and a select few academic supporters could maintain belief in Freeman's discoveries. I first met Leon Paul Freeman--everyone called him Paul--in October 1987 when we were both filming the segment about Bigfoot for the ABC Network's Good Morning America program . On this occasion, and when we met later at the ISC meeting, we got along well. In subsequent phone conversations he was always cordial, despite the fact that my articles questioned his reliability as a witness and evidence procurer. On one occasion he lamented the fact that Krantz would not examine his cave paintings of Bigfoot, an indication that even the credulous professor had a gullibility limit. Paul even gave me a bust he'd crafted of Bigfoot, a photograph of which graced the front cover of the Skeptical Inquirer for the issue on the Mill Creek tracks. I liked Paul and when we chatted during a break at the ISC meeting he let me take his photograph. At one time he talked about a museum as a place to sell his busts of the creature, along with other Sasquatch art and artifacts. Although the museum never materialized he did have a triumph, so to speak. When the Dryers Ice Cream Company decided to run a series of TV advertisements about how unbelievable their product tasted, they elected to feature a number of unbelievable stories. For the Bigfoot spot, the Dryers people picked Paul Freeman as a spokesman, the obvious unbelievable choice, beating out researchers like Dahinden and Titmus who'd been in the field much longer. Reportedly Dryers paid Paul $1,500.00 to do the advertisement and the more experienced Sasquatch proponents who'd been passed over were miffed, especially Dahinden. The legend of Bigfoot is not about to die with the passing with Paul Freeman. With the death of Krantz in February 2002 and Dahinden in April 2001, a rumor made the rounds that Paul had not actually confessed to the ABC crew and that my reporting of his statement was out of context. I'm sure that at least some among the older Bigfoot buffs still have a copy of the Good Morning America program. Should they decide to play the tape again they will see and hear ABC'S Steve Fox ask, "You tried to make fake footprints?" with Freeman answering, "Yes, I did." Fox then asks, "To create prints?" and Freeman again says, "Yes, I did." Fox is bent on being absolutely clear and so he asks, "You admit those were fake foot prints," and Freeman is seen nodding in agreement. But this is the land of Sasquatch research and it's possible that Freeman's credibility will be resurrected yet. Certain tracks were faked according to the Dahinden papers Bobbie Short acquired, but other tracks cast in the Mill Creek Watershed, were not. With Freeman dead, only the forensic experts can say for certain which tracks were authentic. The shadow of controversy that surrounded Freeman raises doubts about the video Freeman took in 1982 but again, according to the Dahinden papers, the Freeman bigfoot videotape was the real deal. This article was the updated draft for the published "Skeptical Briefs" June 2003 article. Primate print expert Jimmy Chilcutt of Conroe, Texas thoroughly examined the Freeman footprints. At the 2003 Willow Creek Sasquatch Symposium he announced in his presentation that he found dermal ridges in 'some' of the track casts provided him from the Freeman collection. Despite the reputation that precedes Freeman as a prankster and maker of faked footprints, the pattern and structure of the dermal ridges in a few of the casts were distinct - more or less vindicating Freeman, that at least these tracks were not faked. Chilcutt also established that the Freeman casts had certain dermal ridges that would be impossible to fabricate by a human being. He showed everyone exactly what he had found. The late Dr. Grover Krantz, retired anthropologist from University of Washington at Pullman came up with similar findings. Chilcutt says the dermals are consistent with those of an unknown primate. While Freeman admitted to hoaxing a set of footprints, evidently not all of his casts were faked. Rene Dahinden was less forgiving however, saying that "once a hoaxer, believe nothing else." I find it interesting, if not ironic that Rene, (partied with John Green to one of the biggest BF lies ever told), was the hardest on Freeman... Rene was also ruthless in his battle with Grover Krantz, who was fooled once by dermal ridges that were made by using the outer markings of a walnut shell. None of the senior men in BF research were without flaw, all of them brutally critical of one another even to the extent of hatred and bullying and all of them caught red-handed lying and in verifiable hoaxing themselves! Bear that in mind when you create heroes for yourselves...the senior men were themselves, not credible.